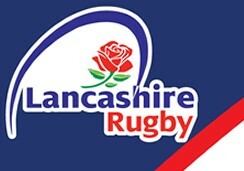 Academy add the Lancashire Trophy to their league title to cap a remarkable season. Despite Manchester already having registered home and away league wins against Blackburn this season, it soon became clear that this final was by no means a forgone conclusion. Even before the match kicked off, the boys were dealt a blow when Luke had to pull out during the pre-match warm up. Things got even worse when, after only 12 minutes, Jordan Lam was harshly red-carded for what was deemed to be a dangerous tackle. This handed the impetus to Blackburn who took an early lead via a well struck penalty. 0-3. The Academy boys struck back almost instantly with a penalty of their own thanks to the trusty boot of Will Harrison. Blackburn were playing with great intensity buoyed by their one man advantage and they made it count after 34 minutes with a converted try. 3-10 at half time and a chance for Manchester to regroup and take stock. The second half was the stuff of legends. Manchester came out all guns blazing and on the 47th minute they cut their deficit down to 2 points. Quick ball fed Ollie who showed great pace to score in the corner. 8-10. On the 55th minute Manchester got their noses in front when it was Blackburn’s turn to suffer the wrath of the referee. ‘H’ was upturned 20 yards out and the red card was rightly flourished after Harry’s shoulder made a hefty dent in the turf. Will converted the resultant penalty to make it 11-10. Blackburn weren’t done yet and responded immediately winning a brace of penalties deep in Manchester territory. Opting not to take the easy points, ‘Burn looked to land the killer blow but they were repelled by courageous defending. The final whistle blew and the boys and their following were in rapture. The ‘double’ secured in a match where the Academy showed immense spirit. No matter what the occasion threw at them, they were never going to be denied their just rewards. This has been a very testing season. The boys began the campaign struggling to find 15 fit and able bodies to take the field. Come Sunday’s Trophy final they had 30 players at their disposal, some of which have already cut their teeth with the first and second teams. This is a clear indication of how fruitful the Academy has already become and long may it continue. Every member of the squad deserves enormous praise. Praise must also go to Daz, Neil, Gary, Anne-Marie and everyone else involved at the club who have made this all possible (apologies, there’s too many to mention). Lastly, to the boys who played their last ‘junior’ rugby match on Sunday, we thank you for the years of service you’ve given to the M&Js and the Academy. Without you Colts rugby still wouldn’t exist at Manchester. We all wish you well in your exams and for the future. The senior squad’s preseason is only a few months away so your rugby journey with Manchester needn’t end here!